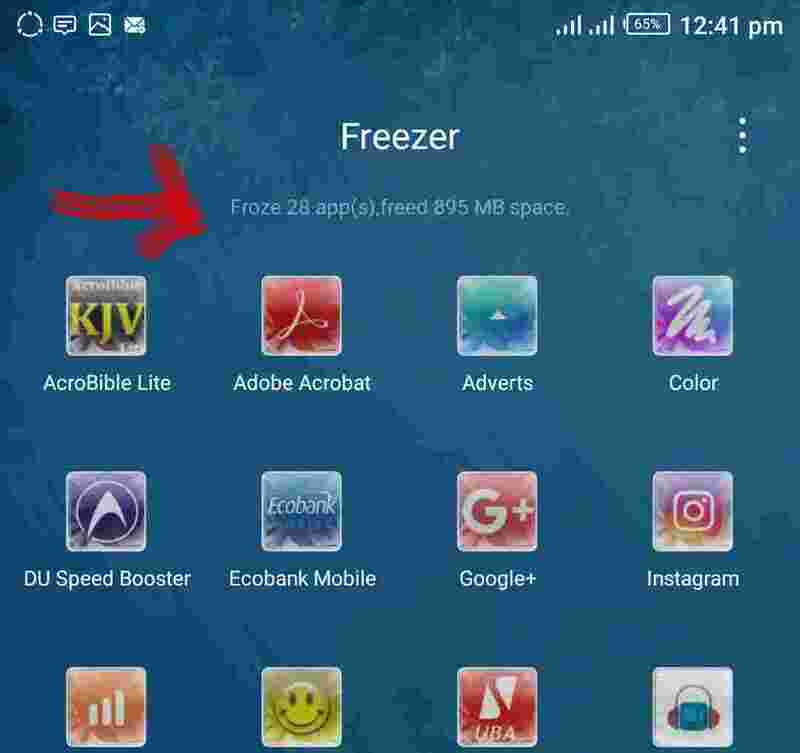 The App Freezer is an extremely useful tool, that comes pre-installed on infinix smart phone that runs on XOS Chameleon or any of the latest XOS 3.0 and 3.2 Hummingbird versions, that can save you a lot of RAM space and some battery juice, but it is sad to say that most users don't make use of this God Given tool, probably because they don't know what it is and what it is used for, or they might not even know it is in their device. That is the reason why, we've taken it upon our selves today, to tell you guys what the app freezer is all about, what it is used for and how you can make use of it to get the most out of your infinix android smart phones. So first of all, let's start by telling you what the App Freezer is all about, and why it is a very important tool in your smartphone. enjoy. 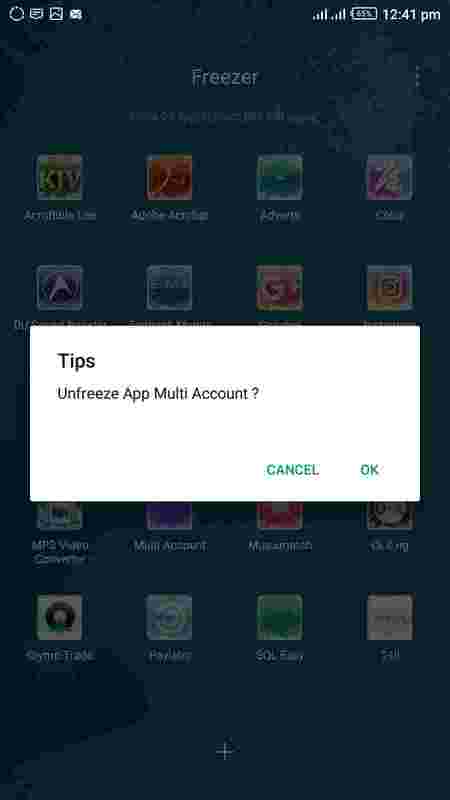 In simple terms, the App Freezer, just as it is pronounced, is a tool that is used to disable unused apps in your smartphone. i.e it automatically makes selected applications in your device to stop working for as long as you want, thereby saving RAM space, and a reasonable amount of battery juice. NOTE: Freezed apps act like they were not even installed in the device, which makes it a very great feature and you wouldn't receive notifications from freezed apps. Also they do not appear on your app drawer, which makes it another great tool to hide apps. 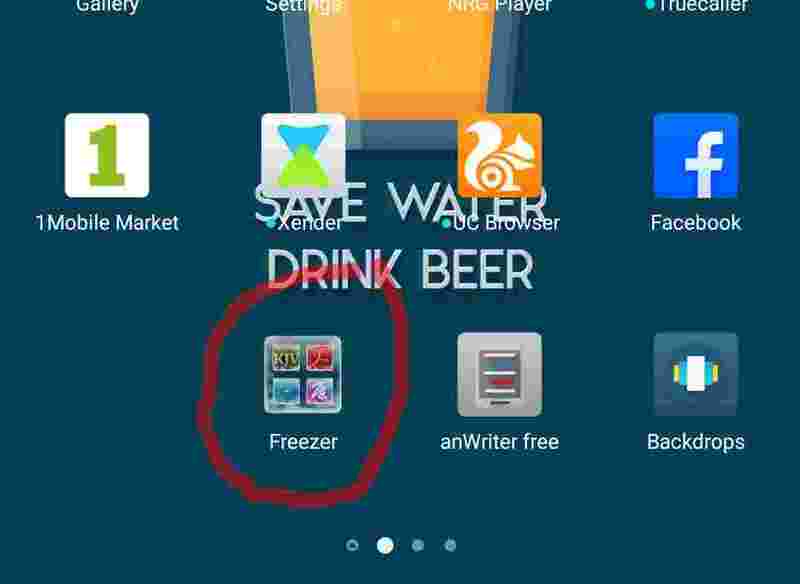 I use the freezer to freeze a ton of apps on my device, and i can't stop testifying on that. 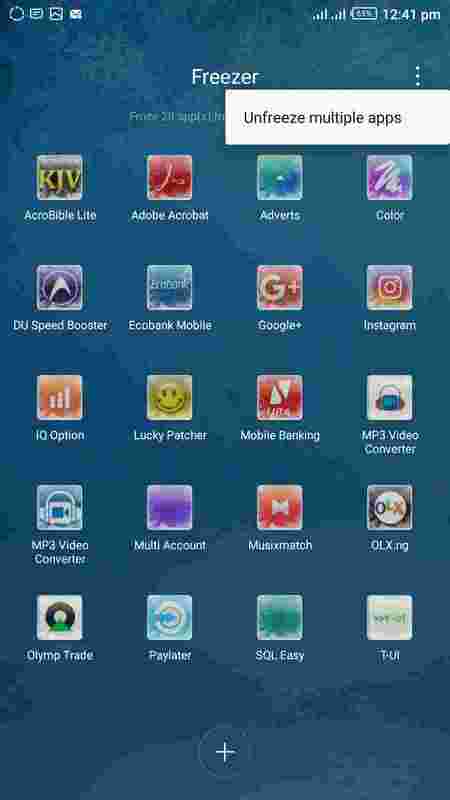 So haven known what the app freezer is all about, and what it is used for, let us go a little bit further, to see how we can set it up, and probably, make use of it, on our infinix smart phones. After migrating back to XOS launcher, you will have to search for the freezer icon on your Home screen, just swipe left or right until you see it, it's not hard to find. PLEASE NOTE - That you can only freeze third party apps, and not the system apps. And that is all, "congratulations you have successfully disabled and freezed annoying battery and RAM eating apps on your device"
Now one good thing about the app freezer is this; you can decide to open, and make use of any app of your choice, without unfreezing it. Just open the app freezer menu, tap on any app to open it and make use of it, and that is all, the app is working, but still remains freezed. So that's it guys for today, let us know if these steps worked for you, and also tell us what other means you've been using to freeze apps and save RAM and battery on your device, by using the comments box below. 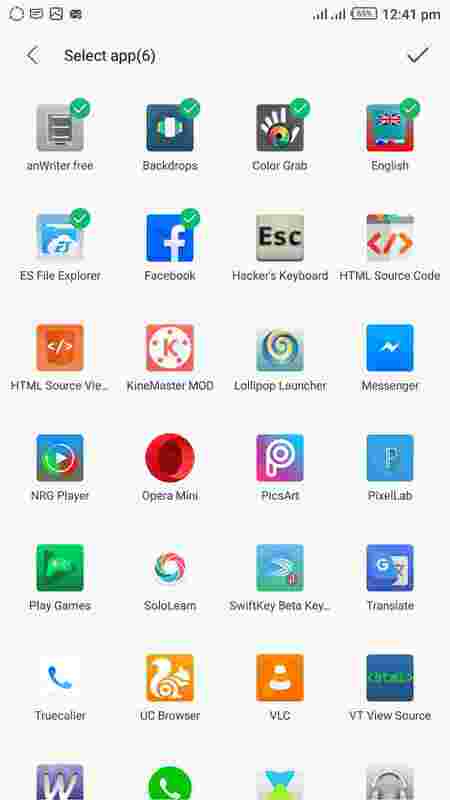 And if you're also interested on how to hide perfectly hide your files and your apps on your android phones, without anyone noticing, here are two articles, that we have for you..
Read These As Well - Using The ES File Explorer To Completely Hide Your Files And Applications On Your Android Phones. Using The .nomedia File Extension To Hide Any File On Your Android Phones. I was trying to arrange my icons so I clicked on "smart arrange" that is under auto arrange and all my icons was scattered. Why trying to re arrange them back, I could not find the Freezer app again. I tried downloading it from playstore but couldn't find it. Someone help. Hello Arun, i'm sorry about your icons getting missing, but on a normal ground, your icons can't just get missing, i will advice you to look carefully, it will be there, the freezer icon can only be seen on your home screen, it isn't included in your app drawer, so just look carefully and you will find it. Is there a way I can still use apps that have been frozen without unfreezing then, I use an hot 4pro. Do I need to download another freezer app. I some how can't find the freezer on my Infinite Note 4. What do I do? Hello Dear, first of all you should know that the app freezer folder cannot be deleted because i once tried doing that on my infinix Zero 4 and it couldn't be deleted. 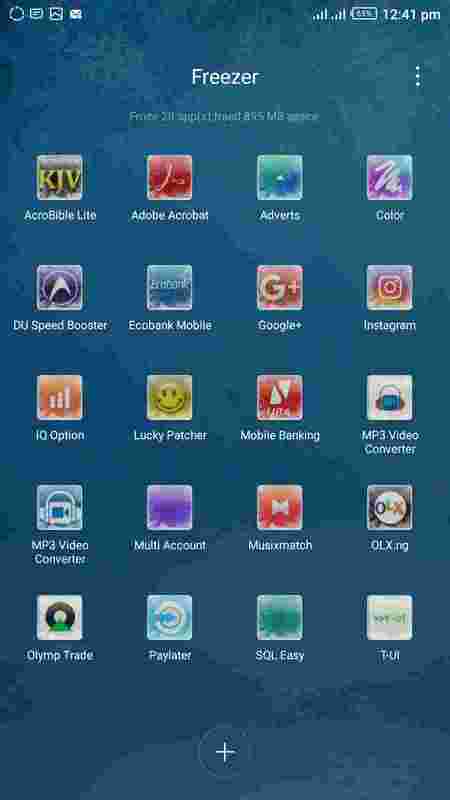 But all i can say to you right now is if you are really sure that you couldn't find your app freezer folder, try downloading the latest version of XOS Launcher from Google Play Store.. Thank You for stopping by and let us know if it worked for you. Hello please been trying to add apps to the freezer app, but it keeps asking that I pin icon to screen. I don't understand. Hello Ebony, i don't know what steps you are using to add your apps to the freezer, but the correct method is, first of all you open the app freezer folder, then scroll all the way down until you see a plus(+) icon, click on the icon, and you will be shown a list of all your apps that are installed in your phone. From there you can select the apps you want and click ok "OK". and that is it. I hope this helps. To ebony, clearing xos launcher app data should solve the problem. My freezer is not working properly .Whenever I tap the add app icon it always tells me pin icons to screen and does not add anything .what's wrong. Sorry about that bro, but i need to know what version of XOS are you currently using and if you have at any time upgraded your phone's android version or have at any time installed and used a custom rom before. Please let me know of all those things before i can know where exactly your problem is coming from. Sorry about that bro, but i've heard like a couple of persons also complaining of this kind of problem. But i think the best thing to do here is to run a factory reset on your phone. But please make sure to backup your files first. Hello Sanmi, first of all i must apologise for the late reply.. And now to your issue, you must have probably missed your infinix app freezer simply because you are using a third party launcher on your infinix phone, because naturally, the Infinix App Freezer sits comfortably on your homescreen and there's no way it could be deleted, so in order to get back to it, i will advise you to switch back to the default XOS Launcher and you will find it. Now how do you switch back to default XOS Launcher, all you have to do is go to your app drawer, search for XOS Launcher icon, when you find it, click on it, and on the homescreen, you will see your app freezer smiling back at you.. thanks for stopping by Sanmi, and please let us know if we were able to solve your problem.. bye for now and have a very nice day ahead..
Alright Sanmi, so since you couldn't locate the XOS Launcher app icon on your phone's app drawer, you should know that there are many ways to kill rat, but the most important thing is for the rat to die. So in this case, all you have to now is go to Google Play Store, in the search bar at the very top of your screens just type XOS LAUNCHER, or Infinix XOS LAUNCHER, whatever way you want it and it should be the first result that will be shown to you. To know if it is the real one, check the makers of the app directly below the app name, it should be written "Shalltry Group", when you see it, just go ahead and download it to your phone and then everything should be back to normal.. Please don't fail to let us know if it worked for you or not, as we are always here to help you out with any more issues you might have been experiencing.. Cheers..
Dear Emmanuel, I'm so sorry for this late feedback. After much troubleshooting my phone even before yoir response came in, I finally got the app freezer back. I so much appreciate your support. Alright bro.. am very happy you got back your freezer.. Please do make sure to stop by next time.. One Love Bro. I can't find my freezer app at all and I have a lot of apps frozen, now I can't access any of frozen apps because the freezer has just simply disappeared from my phone. Hello Unknown, please before we can get to seeing how to go about your problem... May i ask you what Infinix device you're using and what were some of the things that took place in your device before your freezer suddenly disappeared as mentioned by you..
Hello Ayo, please you should take note that the Infinix Note 5 and the Note 5 Stylus smart phones, are different Infinix devices that are running on an entirely different kind of software. Now in this case, your Infinix Note 5 in question is a Google androidOne device, which means that it isn't running on Infinix's own proprietary self customized XOS UI.. So they are bound to lack are those smart features that you always get to see on other Infinix devices..
And downloading the Infinix XOS launcher from Google Play Store won't solve the problem either, because it is just a launcher and it doesn't bring with it all those features you wanted. It is just like going to Google Play Store to download a Samsung Galaxy S9 launcher, yes quite alright, you have the launcher, but you don't have the Galaxy S9 features..So i'm very sorry bro..
And in case you want to learn more about the differences, similarities, and the advantages and the disadvantages between Infinix XOS UI and Google's androidOne UI, please follow this link below.. cheers..
Hello good evening I am having problems finding my freezer I have done everything here and still haven't found my freezer. Hello Dear, all you have to do is..
1. First of all, update your Infinix XOS Launcher from Google Play Store in case it is not up to date. 2. After you've done that, the next thing you should do is to go to XOS Launcher settings page by long pressing on an empty space on your home screen, and select "Menu"
3. Go to the option labeled as "Other Settings". 4. Right in there, you should see the Freezer option with a toggle button right next to it, it should probably be turned off at this time. 5. Tap on the toggle to turn it on. and that is all.. #Cheers.